Hello August and hello to you! Its the 1st of the month today, but I have a feeling it will be the 31st in a blink of an eye. The days are whizzing by and autumn is on the horizon; so say the Chrysanthemums I found in the garden centre at the weekend. And even though I really don’t want summer to end, I couldn’t help but pick up a couple of autumnal coloured ‘mums’ for my front door step as a nod to the upcoming season. Anyway, on to the main topic of todays post. 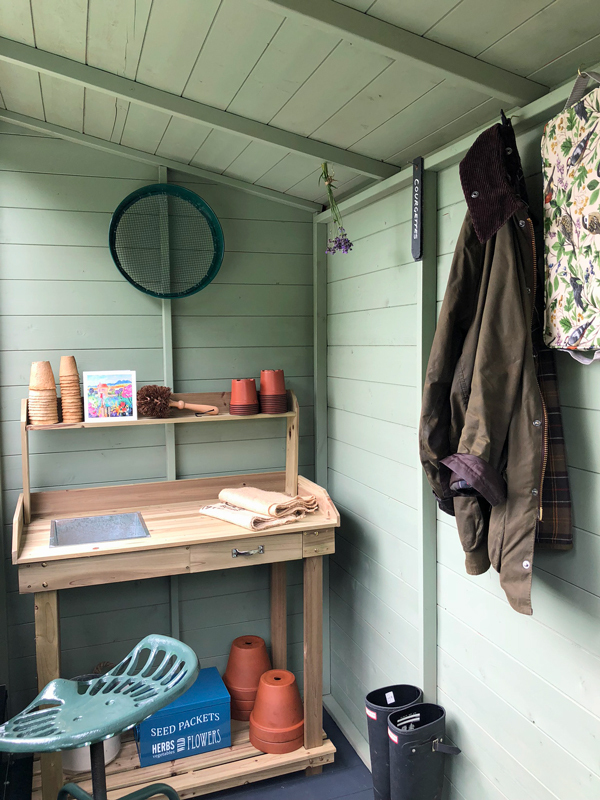 The potting shed! 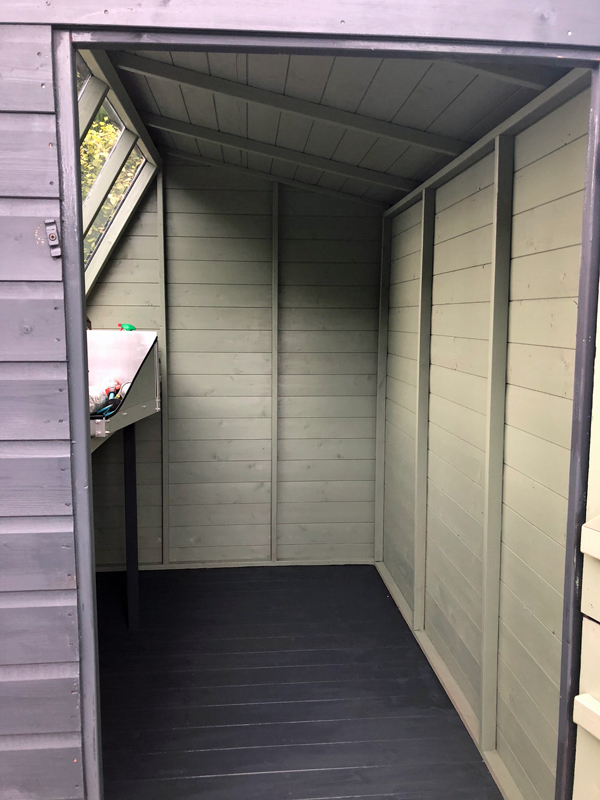 Did you catch the blog post where we built the shed? 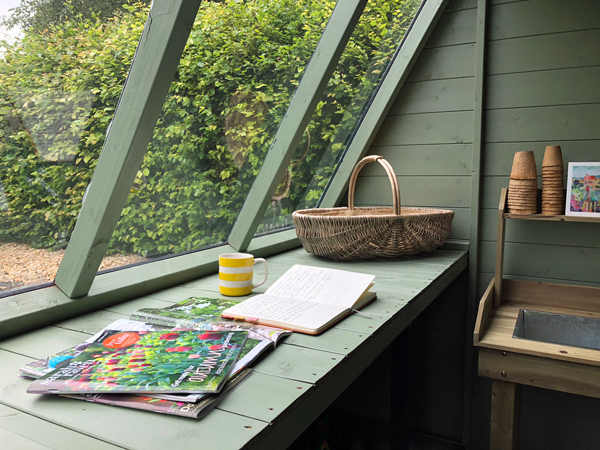 If not you can read all about how the shed came to be here. 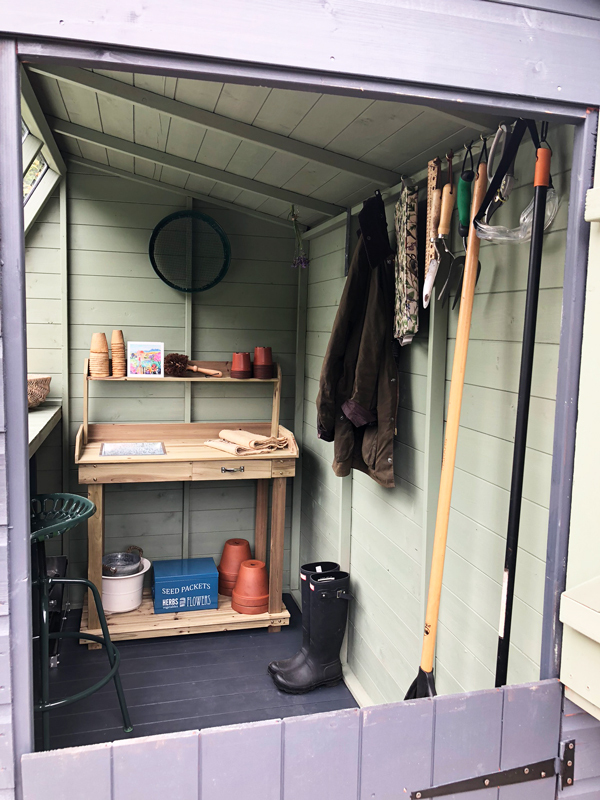 Once it was built, it was very quickly filled to the brim with seed trays, pots of tubers, bags of seed sowing compost and other paraphernalia needed to start the growing season off. Then things got away from me, and the shed became a bit of a dumping ground for discarded pots, tools and the like. Come July and it suddenly looked like this. I went with Cuprinol again for the interior. The paint dries waterproof and is supposedly weather proof for 6 years. 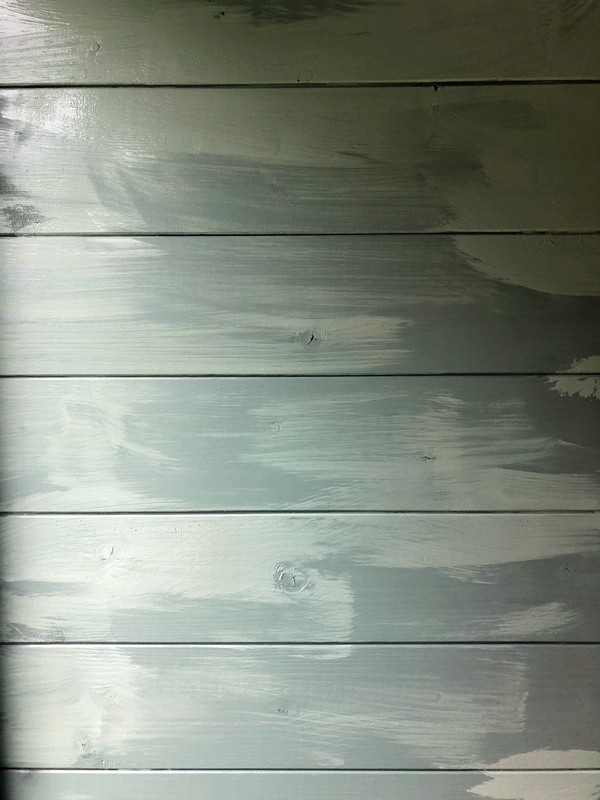 Instead of 2 proper coats. 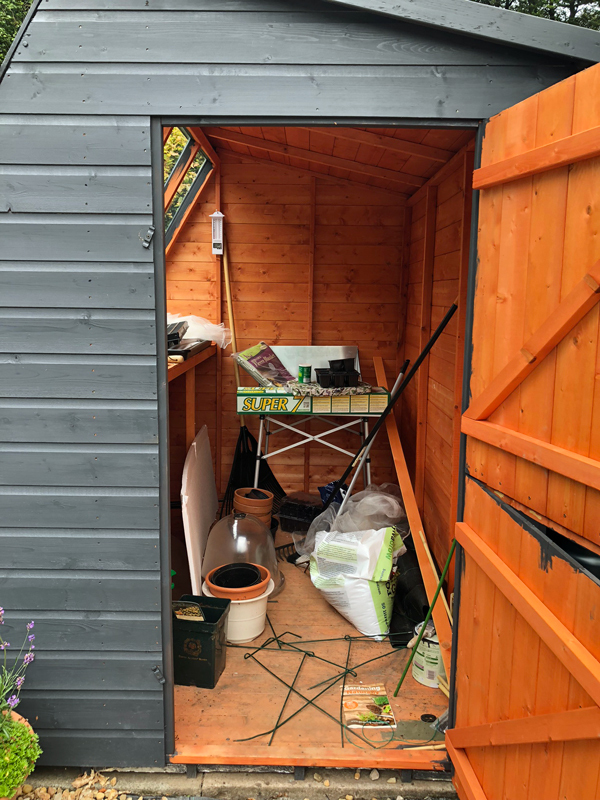 I put on one, then did a swishy affect for the second, so the shed ended up with a more aged look, with touches of the original orange ever so slightly visible. 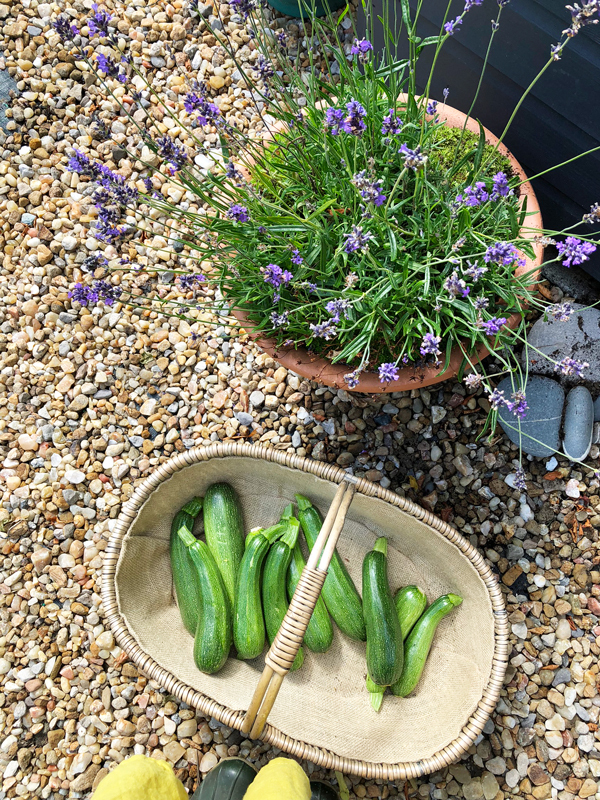 Whilst waiting for the paint to dry I harvest some courgettes. My 9 year old son helped me paint the floor. Well, for all of 10 minutes until the smell of roasting chicken came wafting up from the kitchen and he was off like a shot. 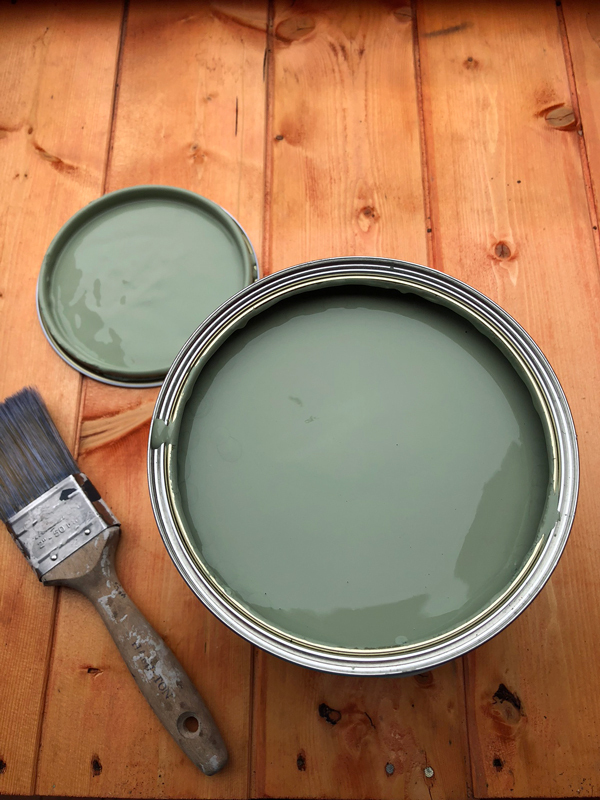 The floor got two proper coats of paint with an hours drying time between them. 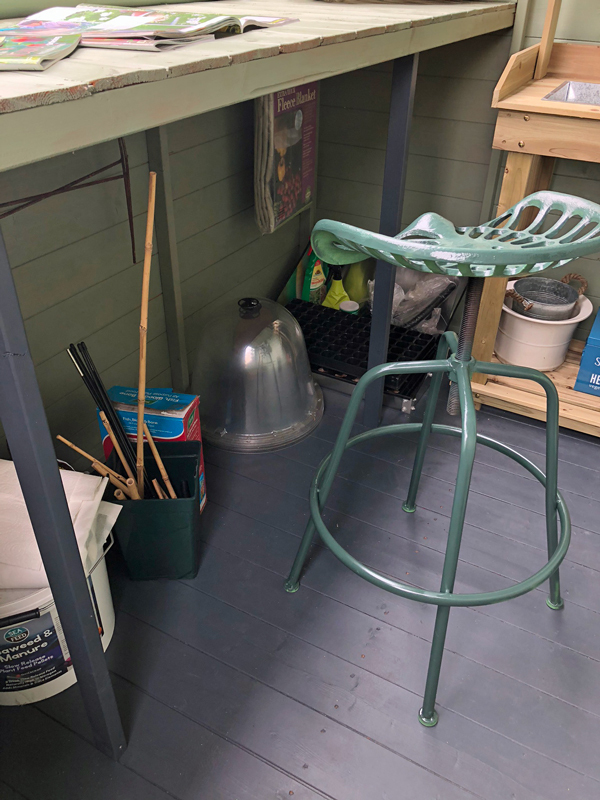 The shed was sorely lacking a place to sit down for a cuppa, so I sourced a vintage style tractor stool from Wayfair online (similar here) and spray painted it Oxford racing green. I may add a cushion at some point. An old funnel makes a great spot for twine. I popped a hole through it and hung it to the wall. A couple of days later and another courgette harvest. Yup more courgettes, which I gave away to friends and neighbours. 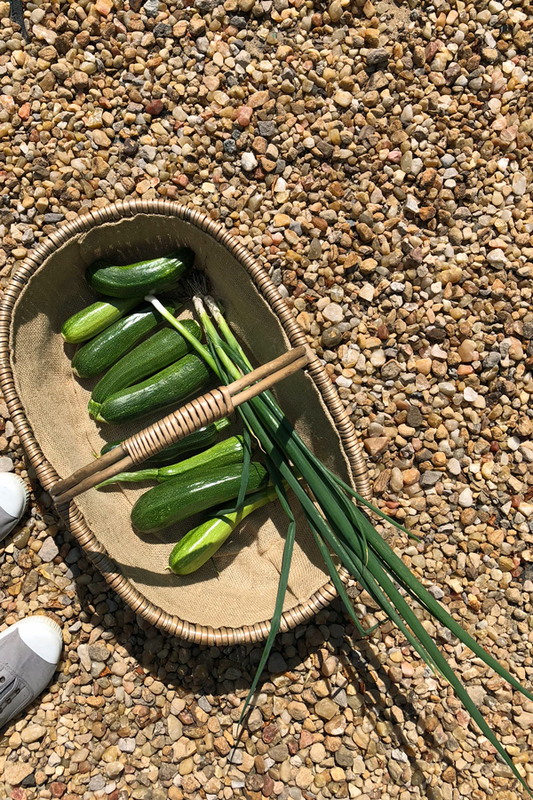 At the time of writing this post I have harvested 51 courgettes in total from just two plants. Needless to say next year, I shall only be planting one! The outside was spruced up with a door handle (exciting times!) and a rustic zinc planter from Rowen and Wren potted up with violas and ivy. 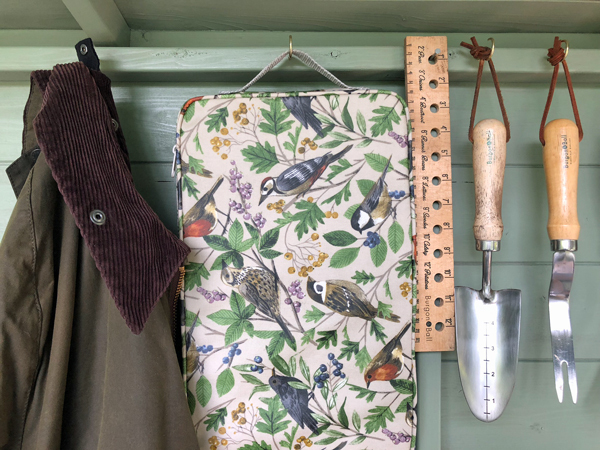 The shed is such a welcoming spot now, that I love to escape to for a read, or to watch the latest YouTube episode from Garden Answer and of course to have a cup of tea in the peace and quiet. 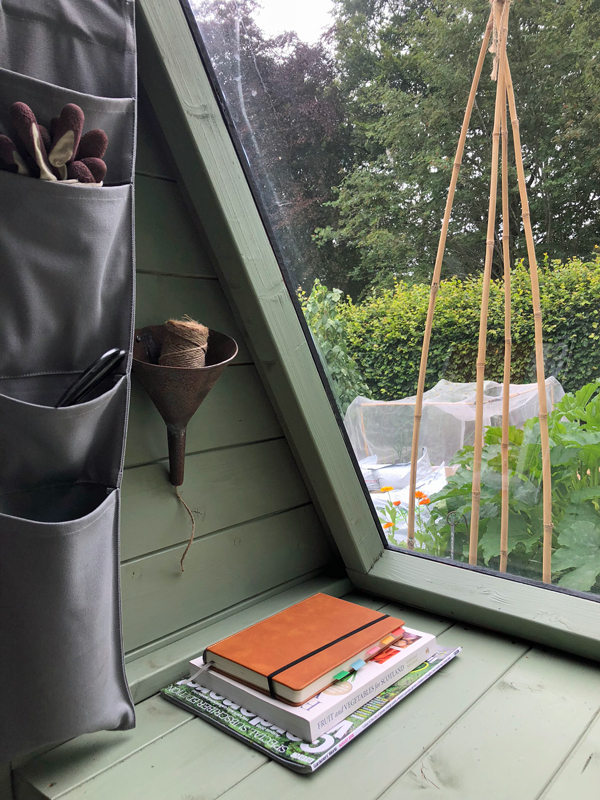 I’m still on the hunt for some galvanised bins for compost, sowing mixes and grit, but all in good time. The shed is from Tiger sheds and is 8 x 6 ft. A great size, especially with the full length staging table. And there you have it my little bolt hole behind the beech hedge. A winter crop of beetroot seeds were sown where the spring onions were harvested. 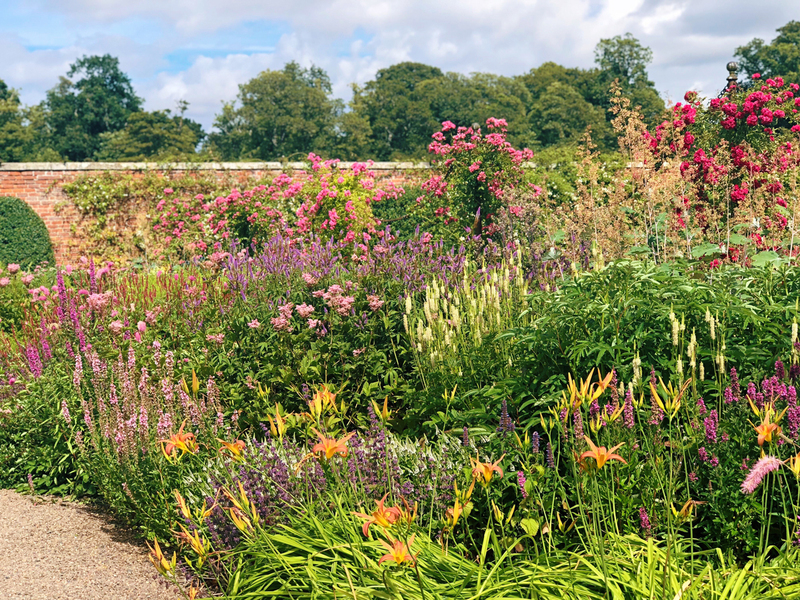 The rose garden area was cleared out and and a hedge of english lavender and the first rose were planted. The rose variety is a beautiful climber called, Teasing Georgia by David Austen. 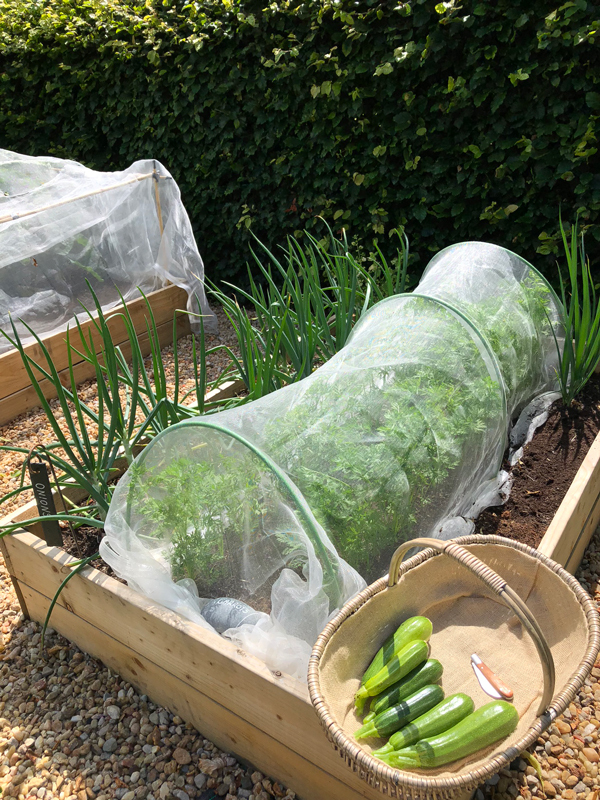 The broccoli plants have been pulled up, and winter cropping leek (Musselburgh) and spring onion (White Lisbon) seedlings have been popped in their place. Lastly, I started off an experiment with some pea seedlings (Kelvedon Wonder) from Harrod Horticultual. Its very late in the year to be growing them up here in Scotland, but you never know! *this post uses some affiliate links, which if you click on, I earn a tiny commission. The shed looks great. I like your choice of colours.